Peanut is beneficial for health. But when the peanut is mixed with jaggery, its health benefits increase. During pregnancy peanut and jaggery is a blood circulation propeller. With this, the functions of uterus are proportional. This is beneficial for the baby’s development. During periods, it is beneficial to avoid back pain. Peanut and jaggery contains oleic acid. The consumption of it controls cholesterol level. This avoids heart diseases. 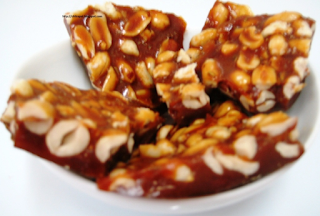 Peanut and jaggery contains selenium and other anti-oxidants. This avoids fertility related problem. Peanut and jaggery contains protein and calcium. This strengthens teeth and bones. Peanut and jaggery has fibers that avoids stomach problem such as acidity or constipation. The consumption of peanut and jaggery removes toxins from the body. This makes skin color white and increases shine of the hair.